The adoption of artificial intelligence in healthcare is set to solve several problems for patients, clinics, hospitals and the industry as a whole. The healthcare industry is gradually evolving toward an ecosystem of supportive and collaborated machine learning. Every healthcare industry professional is pondering on whether artificial intelligence is suited for their own personal professional environment. If nothing else, it is a clear indication that the healthcare industry is seeking intelligent solutions to its present problems. However, there is still pervasive confusion on the significance and derivatives of AI in healthcare. Several computer-related solutions that are present in the healthcare industry are not directly related to computer intelligence, but are erroneously considered to be part of Artificial Intelligence (AI). The above-mentioned solutions are merely manually created algorithms that assist with data analysis and treatment recommendation. Machine learning, on the other hand, is a system wherein the computer is able to intelligently perform tasks that are similar to those undertaken by the human brain. These types of solutions have complex interwoven analysis techniques, which are designed to able to undertake intelligent tasks and predict outcomes based on historic feedback and the recognition of patterns. It addresses prevalent problems in the healthcare industry through predictive analytics and AI medical applications. The first and most excruciating pain point is the inefficient accumulation and transfer of patient data. The information usually gets corrupted or lost and is thereby rendered useless or inefficient. This has a ripple effect through the entire lifecycle of healthcare due to its adverse effect on treatment, claims and reimbursement. This inefficiency can be attributed to the complex nature of patient data and the extent of accuracy that is required for smooth functioning. Another issue is the maintenance of privacy and security and the regulatory requirements of medical data. Data sharing is a common problem due to the lack of systems and laws around it in the industry overall. Clinicians and physicians are lacking an efficient communication platform that creates loopholes in the execution of healthcare treatments. Information sharing is not executed efficiently and even where it is active, it is usually done in an unstructured and ineffective manner. The inefficiencies within health systems databases add to the woes of information sharing. Further, with the divergent interest and priorities between clinics, hospitals, physicians, specialists and insurance companies holistic patient care is a distant ideal. The new approach of patient-focused healthcare is difficult to achieve when every individual entity is looking to promote its own interests. A general hesitance toward the adoption of new technologies and solutions has been a hindrance within the healthcare industry for many years. Insurance companies and healthcare professionals are very slow in adopting technologies that are specifically designed to increase efficiency due to a fear of added costs and unfamiliarity. Question: How to identify if the business is complex enough to require artificial intelligence? Answer: The first and most important question is whether your business stands to improve through the use of machine learning. This requires an initial analysis and understanding of the challenges facing the business and if these can be addressed through the incorporation of Artificial Intelligence (AI), more specifically through the deployment of machine learning. If the business or organization in question is struggling with a massive amount of unstructured data that needs to be organized and efficiently transmitted, then you might be wise in opting for data solutions that are offered within the artificial intelligence purview. These solutions work towards structuring and indexing data that can then be used meaningfully, without the wastage of human hours. Structured data increases the efficiency of the entire lifecycle of healthcare. Next in line is the need for predictive analysis to develop patterns within the organization. 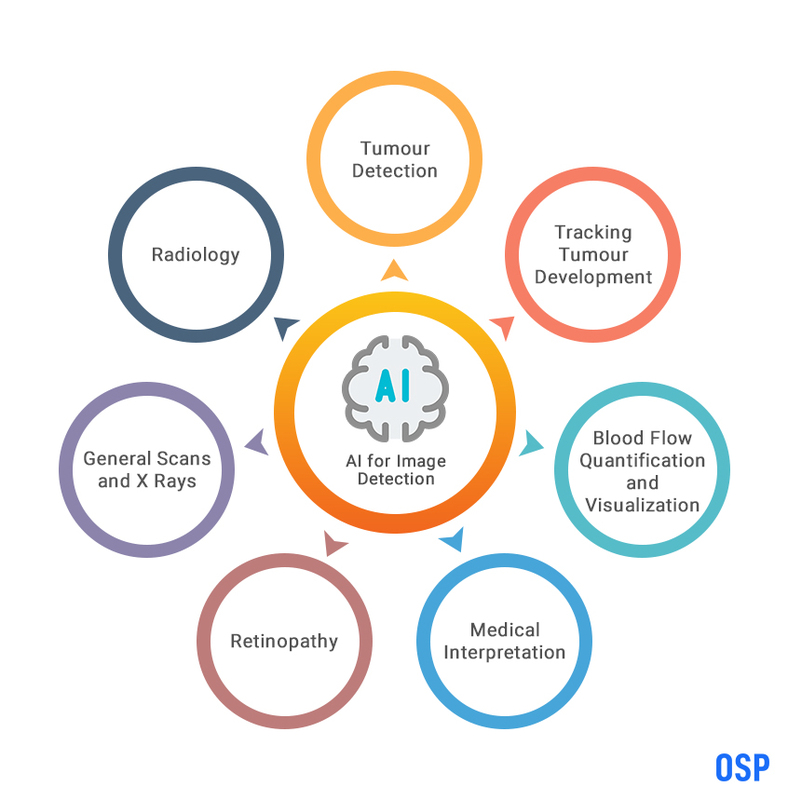 If the business or organization stands to benefit from prediction through the analysis of tends and past patterns, be it for claims and reimbursement or treatment analysis, then AI medical applications may be the right direction for business investments. An unnecessarily large amount of expenses can be easily managed through the deployment of AI-assisted medical care that will go a long way to reduce added costs and expenses for the patient as well as the organization. Finance-based solutions are particularly helpful for hospitals and large healthcare organizations. Question: How can AI wearables stop denial claims before they occur? Answer: The management of claims denials is among the top priorities of most healthcare organizations. It has a lasting and direct effect on the patient and healthcare provider alike. This is because every claim denied translates into lost revenue. Several AI wearables can contribute to a drastic reduction of denied claims, causing a significant increase in revenues for the organization and better healthcare accessibility for the patient. Claims denials usually occur due to inaccurate documentation, uninsured claims, missing information, etc. It is of utmost importance to enter accurate and complete information while filing a claim. More often than not, basic patient information is incorrectly entered due to common errors, such as typos, that end up resulting in a denied claim. Incorrect coding is another significant reason why claims are denied. Timely filing of claims is another prerequisite to avoid claims being denied. 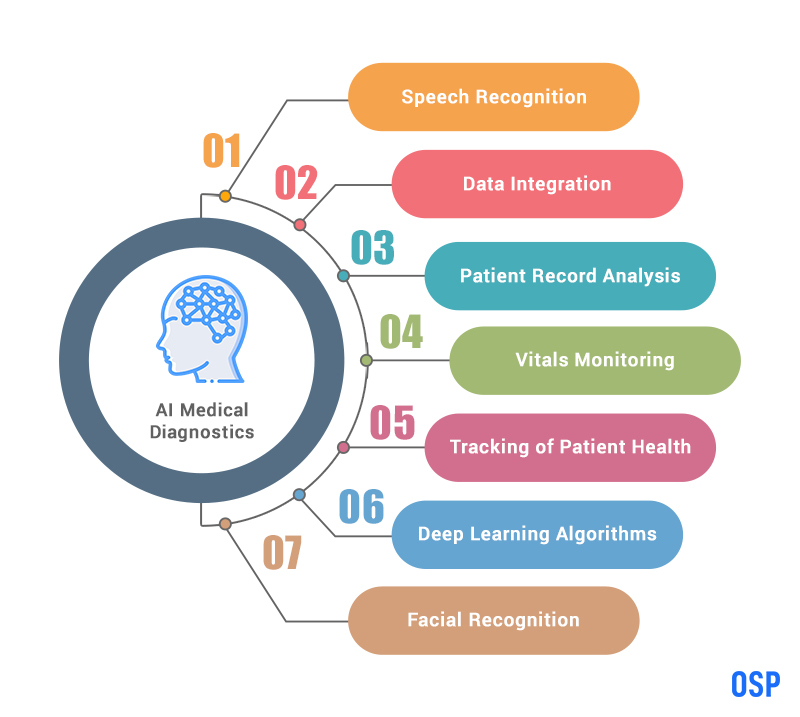 Automated entry of patient information to ensure accuracy – AI solutions that automatically enter and correct any inaccuracies in the patient’s data to ensure that there are no incorrect spellings, etc. while submitting the claims. Flagging of areas that are missing essential information related to the claims – In the event that information is missing or incorrect, while filing a claim, the software is embedded with the capacity to highlight that area of missing or incorrect information for rectification before filing. Automated error-free coding – Manual coding is prone to errors due to the large amounts of codes and their constantly evolving nature. The automated system takes care of coding in an error-free fashion and considerably reduces the risk of a claim being denied. Predictive analysis that automatically establishes a pattern of all past denied claims – AI solutions are embedded with the capacity to form complex patterns that analyze and identify past denied claims. They, then, provide evaluations and recommendations based on this intelligent analysis, which can ensure that further claims don’t succumb to the same pattern. Question: How can AI help payers achieve their goals in medical care? Improved Health Results – On a general basis, healthcare providers procure patient information prior to their physical interaction with them. Deploying an AI-driven solution instantly uplifts these interactions and the efficiencies involved by devising effective strategies of treatment plans. This is executed through an analysis of the patient’s history and care notes that allow the healthcare providers to offer enhanced healthcare. It can further suggest appropriate areas of information procurement from the patient. 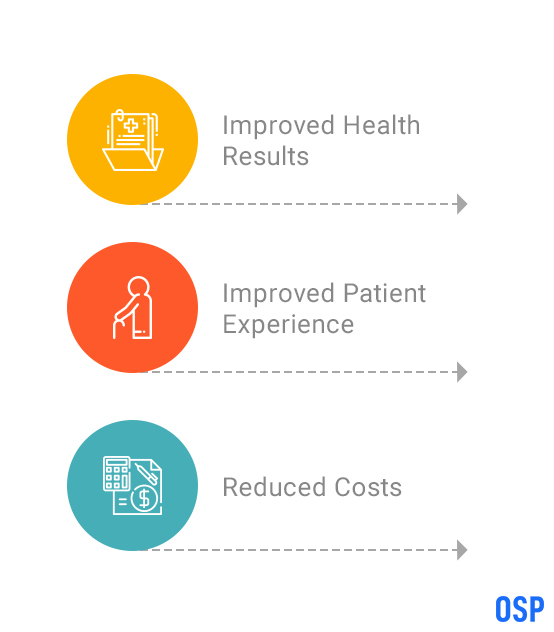 Improved Patient Experience – Going through the entire range of applicable benefits is a tedious task for most administrative employees and healthcare providers. AI technology can be compared to virtual administrative officers that are capable of holistically improving the patient experience through prompt resolutions, efficient query rectification, and suggested solutions. Reduced Costs – Through the use of artificial intelligence, healthcare professionals can undertake an analysis that introspects past claims and data to extradite eligibility scenarios and resolve queries. For members, the software is capable of identifying gaps in chronic healthcare and suggests preventive care measures. The vast amount of data is intelligently structured and applied meaningfully to improve member experience and reduce the costs of the healthcare organization. Question: How high is the threat to cybersecurity for AI-driven solutions, with relation to Electronic Health Records (EHRs)? 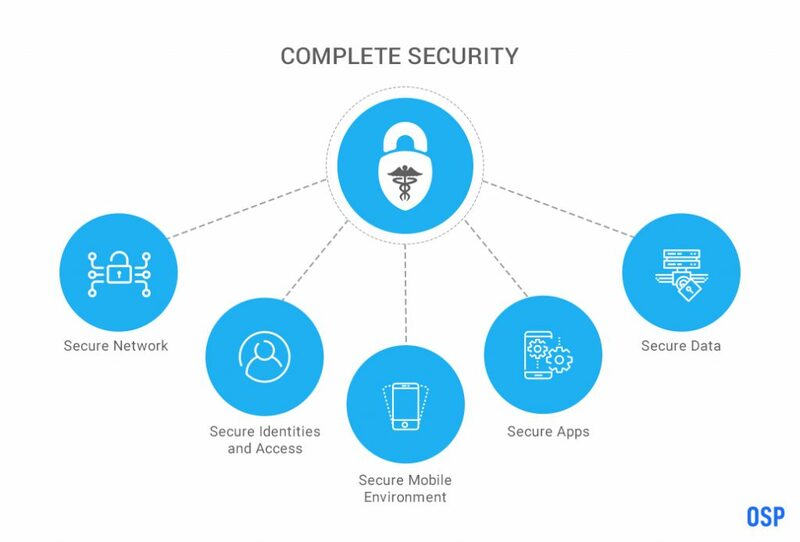 Answer: With the evolution of the healthcare industry into an increasingly digital environment, cybersecurity is a concern on the mind of most healthcare professionals. The existence of crucial and private patient data and EHRs makes this an all-important priority. Although the threat is high, there are several solutions to safeguard against cyber threats. Through the installation of advanced firewalls, inspection and antimalware programs, spam discovery filters, and network isolators, security control is enhanced in the virtual world. Access is limited through secure identities and authentication processes, without which data will not be visible. Further, there are several solutions available that follow strict cybersecurity configurations for enhanced security. They also undertake threat modelling across devices for strict adherence to secure practices. Finally, through the use of encryption techniques, rights management options and inspection criteria, patient and professional medical data remains highly protected. Question: How will AI augment image detection for clinical decisions in healthcare? Answer: The advantage of AI-related medical services encompasses image detection in healthcare significantly. Electronic Medical Records (EMRs) are unstructured and cumbersome to sort through due to the accumulation in a hap hazard fashion. Physicians find these overwhelming volumes of data cumbersome to sort through and identify the ones that are clinically relevant. This is where AI steps in. Although the cost is high of deploying these image detection solutions, they are created with the ability to considerable enhance the professionals ability of image detection. Question: How does AI offer predictive medical testing and applications? Answer: Predictive analysis is a feature of artificial intelligence that has been highlighted as one of the main advantages of this technology. This predictive feature is not solely confined to claims management, but also extends itself toward medical diagnosis of medical tests that detect infections, conditions and diseases in laboratory settings. These tests are generally, in vitro diagnostics (IVD), wherein the same is taken from the human body (such as blood or tissue) to scan for results. However, medical diagnostics AI applications are still in their nascent stages and will be continually evolving over the next few decades. Its reliability and efficiency are still to be completely analyzed. Although, it is safe to say that this is going to be the next big thing in AI-driven solutions. How to Start Applying Artificial Intelligence to your Business Problems? Solutions Driven through Algorithms: These are applications that have built-in algorithms that are evidence-based and programmed manually. These algorithms allow the computer, through data inputs, to use the entered information and apply it to find a solution, such as, treatment solutions, claims denials predictions, suggested therapies, etc. Visual Solutions: These are AI-driven tools that offer facial recognition, data recognition, etc. to create patterns that can easily escape a trained human eye. This is done through the use of intelligent machines that excel in the field of medical diagnostics. Medical Practice Solutions: These solutions are provided to decrease the work load on healthcare professionals and administrative staff by allowing the software to perform the mundane, but crucial duties of patient data entries, claims management, etc. The above three distinctions will help a business or organization analyse and decide their own areas of requirement and which AI tools are intended specifically to aid their personal work environment. 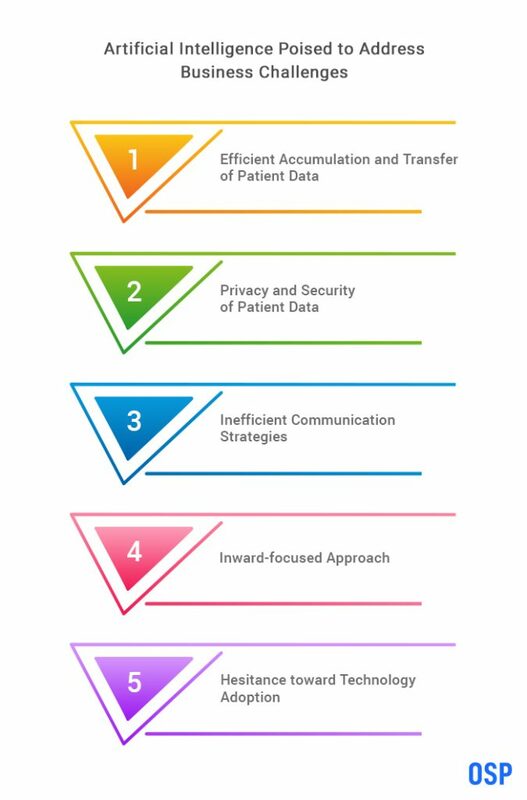 The healthcare industry is currently experiencing a difficulty in the management of volumes of data, inefficiencies in data accumulation, security of patient data and regulatory requirement compliance, and overall communication barriers between different entities in the healthcare workflow. There is a general sense of hesitancy, within the healthcare industry, toward the adoption of new technologies due to a lack of awareness and an assumption of high associated costs. Many of the pain points that continue to affect the healthcare industry today can be easily mitigated through the deployment of Artificial Intelligence (AI). Artificial Intelligence is a host of processes which empower the computer to undertake intelligent tasks that mimic the human brain. The solutions are made up of complex algorithms that can create patterns, predict outcomes and even offer suggestions for improvement. 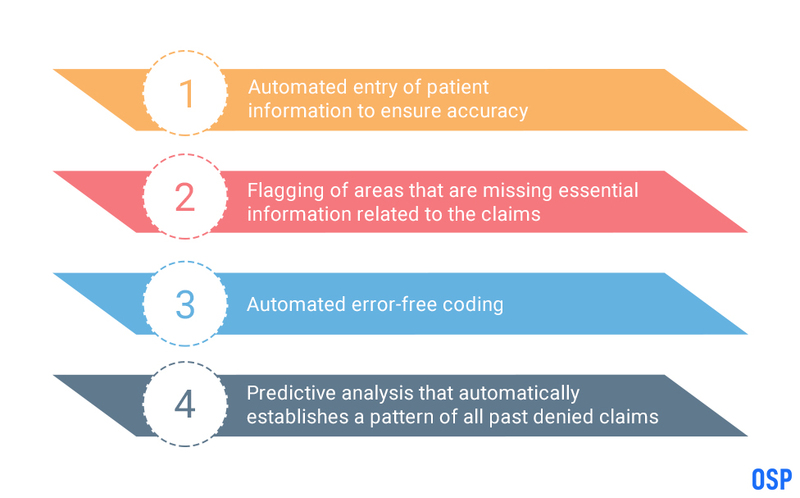 The predictive analysis features of AI-driven software is capable of significantly reducing denial claims through intelligent prediction and flagging of incorrect or incomplete claims prior to submission. The overall healthcare and patient experience is improved through the use of AI solutions, along with reduced costs of the business. With every technology comes a threat of cybersecurity. However, healthcare AI solutions are embedded with several features that can mitigate the risks of cyberattacks. Image detection, clinical decisions, and predictive medical testing and applications are all enhanced through intelligent machine learning. AI applications can be categorized into algorithm-based, visual-based and medical-based solutions. Each of these has their own distinct areas of expertise and advantages. Even with the distinct benefits that AI solutions can offer to the healthcare industry and a particular organization, they can never be used as a replacement to doctors and specialists. 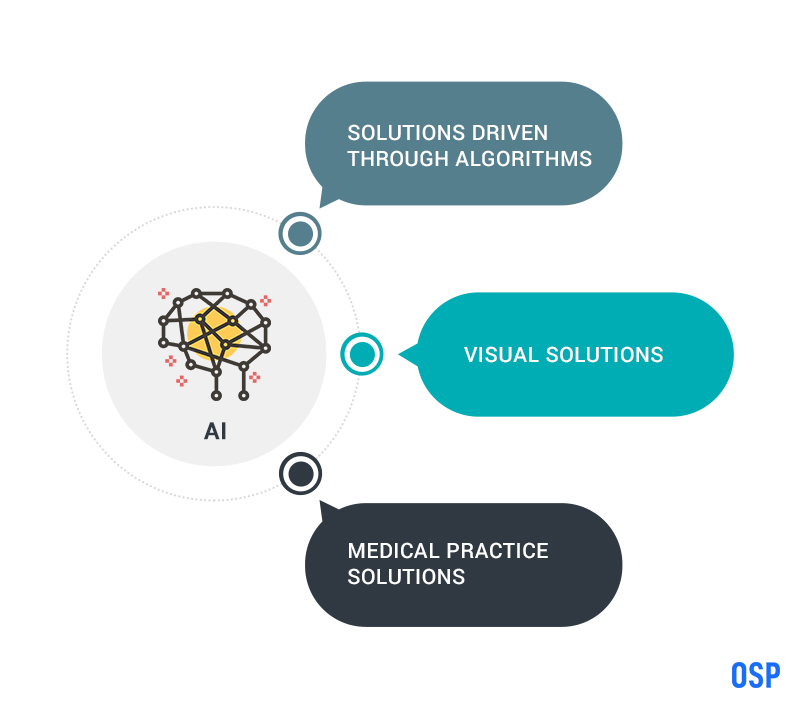 AI solutions are ideal as an aid or necessity to the healthcare professional.